The Ghanaian government is actively supporting the renewable energy sector with special regulations. For the whole energy sector, the National Energy Policy is the main important policy. Moreover, this policy clearly states renewable energy to be an important topic. By increasing the proportion of renewable energy in the standard energy mix, climate change can be mitigated. The goal of this part of the policy is to increase the proportion of renewable energy to be 10%. There also is a regulation specially focusing on renewable energy: the Renewable Energy Act. This establishment of the act was in 2011 to increase the renewable energy supply within the country by the use of pricing incentives. 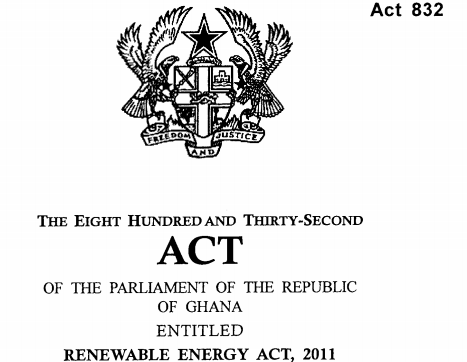 Specifically, the act enables four key mechanisms for the renewable energy sector in Ghana. Renewable Energy Fund. This fund finances thee promotion, development and utilization of renewable energy. Read more on this on our subsidies page. More detailed information on these mechanisms later on. To support this act, two key institutions are in control of the implementation. Firstly, the Energy Commission, the technical regulator of electricity in Ghana. The second is the Public Utilities Regulatory Commission, who regulate the utility services in the electricity and water sector. This means both institutions do not only oversee the renewable energy area, but also the natural gas generation and utility and the regulations around it. As mentioned before, this policy mandates every electricity distributor or bulk customer to procure a percentage of the total purchase of electricity to come from a renewable source. This percentage is specified by the Public Utilities Regulatory Commission ad the Energy Commission. The distributors or bulk customers shall also pay a premium to the Energy Commission. As a matter of fact, in the case of failing the purchase of this specified percentage, the electricity permit can be revoked and a fine has to be paid. As noted before, this installed rate assures a higher price for renewable energy, implemented by the Public Utilities Regulatory Commission. The Feed-in Tariff rates started in 2013 and get a modification every 2 years. This last revision from 2016 shows a foundation consisting of three basic rules. The allowance of a PV plant without grid stability or a storage system to connect a maximum of 10 MWp (Megawatts peak) to the distribution system. There is a maximum of 20 MWp for a solar PV plant without grid stability or storage systems to be connected to the national transmission system. As stated before, every operator of a distribution or transmissions system in Ghana should, according to this regulation, connect a generator from an renewable energy source. Nevertheless, the costs for this connection are borne by the generator of renewable energy. To get involved in the renewable energy sector, or the solar sector in specific, the regulations also require a licence for this. This involvement contains the commercial acts of production, transportation, storage, distribution, sales and marketing, importation, exportation and re-exportation and the installation and maintenance of renewable energy. The application is supposed to be made to the Energy Commission who will decide within 65 days if the licence is granted. Furthermore, the licence is not transferable without approval.